Tatry Ski Club Inc. is a family orientated club which provides its passionate members and guests with mid-week accommodation or weekend accommodation in both winter and summer for outdoor sports and events. 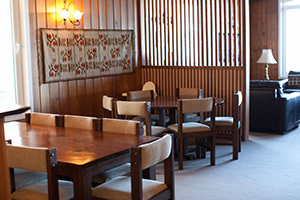 Named after the Tatry Mountains in Poland, the Ski club provides lodge-style family friendly accommodation with communal kitchen and lounge areas. There are eight bedrooms, six of which have their own ensuites. 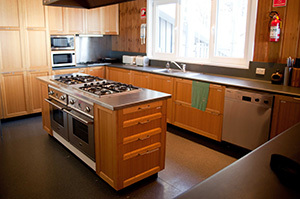 Tatry is a communal lodge, where kitchen and some bathroom facilities are shared. Each bedroom can accommodate a group of up to 5, and has an allocated kitchen cupboard, fridge space and deep-freeze storage also available. Tea, coffee, sugar and some kitchen basics such as salt and pepper are supplied. It is expected that you clean up after yourself and that on the last day of your mid-week stay or weekend stay your bedroom and ensuite bathroom, kitchen cupboard & fridge area are cleaned and left tidy. Rooms should be vacated by 6.00pm. You also need to bring your own bed linen and towels. Doonas and pillows are provided. Due to health regulations, you must have a pillow slip and sheet on your bed even if you decide to use your own sleeping bag. A porta-cot for small children is also available for hire and you must also provide your own linen for this. We have a lodge manager on the premises throughout winter who is able to help with any questions you might have during your mid-week stay or weekend stay and direct you to your room. There is also a white-board near the phone at the top of the stairs which displays the current rooming list. Please be aware that you cannot get access to your room prior to 6.00 pm (exceptions apply). 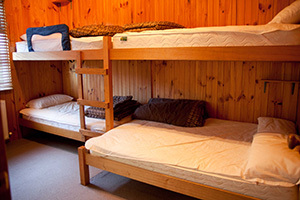 Accommodation rates available on the "book now" page. All great reasons, so visit our “Book Now” page to make your mid-week accommodation or weekend accommodation booking.